I just read a post on Aleydis LJwhere she wrote about a different take on the SCA A&S 50 Challenge – the Stash Challenge. The original challenge is about making 50 A&S things between 2007 and 2015 (that when SCA celebrates it’s 50th birthday). The 50 projects could either be based on depth, breath or persona. I’ve been tempted to pick up the persona challenge, making 50 project that has to do with my persona. On the other hand I doubt that I won’t make 50 things by 2015 either way, making the challenge a bit unnecessary for me. The Stash Challenge (and here) on the other hand is perfect, this challenge is about using all the stuff that you’ve been accumulating in your stash and make 50 projects. At least 50 % of the materials has to be from your stash. I’ll be thinking about this… then we’ll see what happens! That weaving inspiration I talked about the other week is still here! About a week ago I went out in our shed and came back in with one of my ribbon looms (yep, I confess – I have three…). Dug out an old half finished silk warp that I stuffed in a box about a year ago and voilá – I’m weaving again! I’m so excited about it that I even got around to start making a weaving page here on the blog. Look in the upper right corner. The plan is to add new as well as a couple of finished projects there in the future. Back to the current project. It’s a silk braid based on a braid found in London, dated to the 14th century. The plan is to make garters as a symbol for the Order of the Golden Ribbon here in Nordmark. It’s an award for service and usually comes with a somewhat (in my opinion) weird looking black chain with a golden ribbon (like the one you use to hold your curtains) in it. I never got one when I got my award so a while back I though I’d make my own attempt to a more period looking symbol of the award. 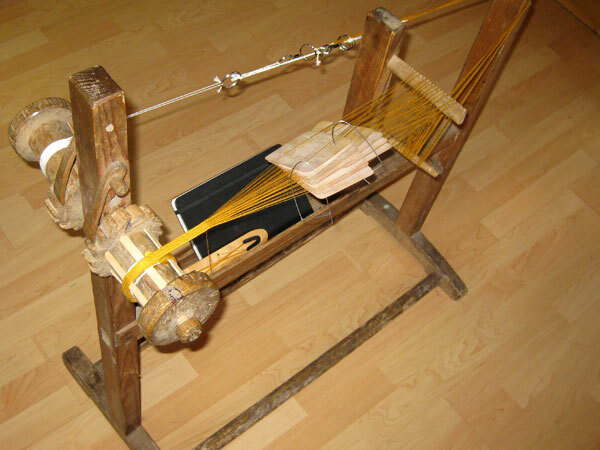 Ribbon loom with a tablet woven silk warp.